This case study focuses on the environmental issues of drought and desertification in Botswana and its impact on the increase of land-use conflicts. The relationship between the environment and the potential for conflict is cyclical, whereas the high levels of communal grazing are coupled with scarcity in water and competition among ethnic groups in the midst of a growing population results in the spread of desertification. This environmental impact continues to increase the size of the Kalahari, making Botswana's policy initiatives to stave off land-use conflicts even more essentia. Natural resources are the main source of economic sustenance within Botswana, specifically within the Okavango River Basin. This area, shared by Botswana with Angola and Namibia, has historically been utilized as a main water source and the lush surrounding areas have been central to the way of life for the ethnic groups of this area. In Botswana’s north west alone, 90% of the inhabitants either directly or indirectly rely on the Okavango system to support their livelihoods(Mbaiwa, 2004). These subsistence strategies include crop cultivation, livestock farming, fishing, and hunting. Given the dependence on the Okavango for the livelihoods the inhabitants in the surrounding area, any negative environmental impacts are bound to affect livelihoods downstream and cause resource conflicts with rural communities living in the Okavango Delta area (Mbaiwa, Ngwenya, & Kgathi, 2008). Taken in context of the environmental degradation and the majority of the population being dependent upon groundwater for lack of rainfall, the potential for conflict is rather high. The availability of surface water is very scarce in Botswana and less than 5% of the agriculture in the country is sustainable by rainfall. This creates a reliance upon groundwater and the continued drilling for water further exacerbates the desertification that is occurring naturally("Environmental Issues in Botswana,"). The main issues are dependent upon land-use and the increasingly scarce water and grazing lands that have been subject to nearly uncontrolled depletion for the past thirty years. 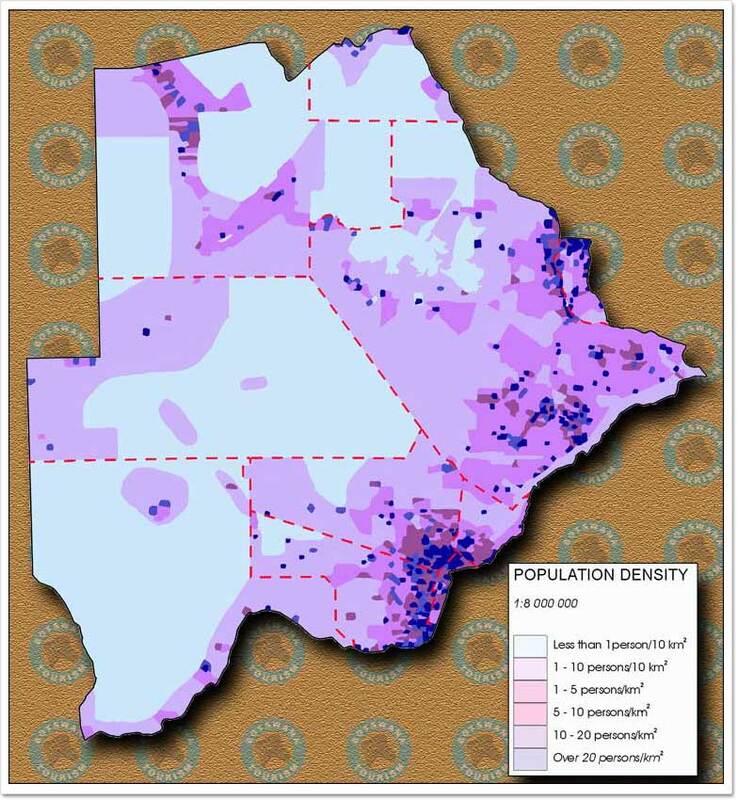 In 1975, the Tribal Lands Grazing Policy was enacted and prompted a large move into the Kalahari to reduce the amount of herdsmen in already crowded settlements. Many of these herdsmen have continued to move westward and contributed to the large-scale vegetation depletion throughout the country and satellite imagery is revealing significant environmental impacts. Most recently, images have shown that there is an abundance of uncontrolled cattle post development and 71% of the country’s land is used for communal grazing ("Environmental Issues in Botswana,"). There has been an emergence of land use conflicts and degradation in tree savannas as a result, and this trend will likely continue to expand without significant policy intervention. The drought and desertification issues within Botswana will continue as land use conflicts arise and water scarcity continues. 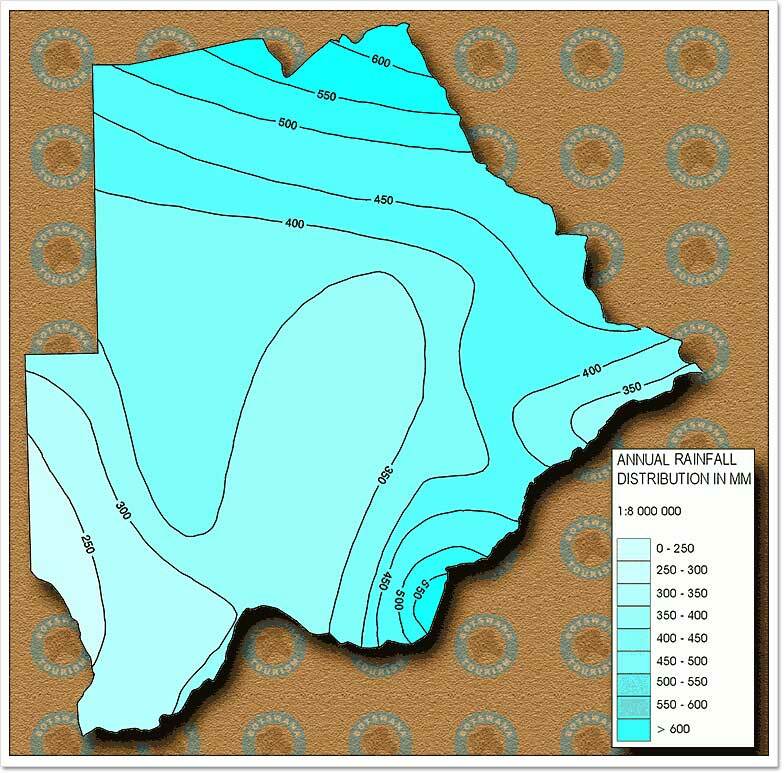 The 1975 policy regarding Tribal Lands Grazing has contributed to cast amounts of unchecked grazing development and is directly impacting the expansion of the Kalahari. The climate will directly contribute to the potential for conflict through 2050. In terms of climate prognosis, experts predict that the semi-arid parts of southern Africa may warm by as much as 1.6 degrees Celsius by 2050. This projection equates to a warming rate of about 0.2 degrees Celsius per decade. These temperature changes are expected to lead to open water evaporation as well as have detrimental effects on plant and soil composition. Experts indicate a predicted increase of evapotranspiration of five to ten percent across the African subcontinent by 2050(Robert Tony Watson, 1998). As usable land becomes less available, ethnic populations that have not historically interacted will be forced to collaborate regarding available natural resources. This gives potential for conflict without effective policy intervention. 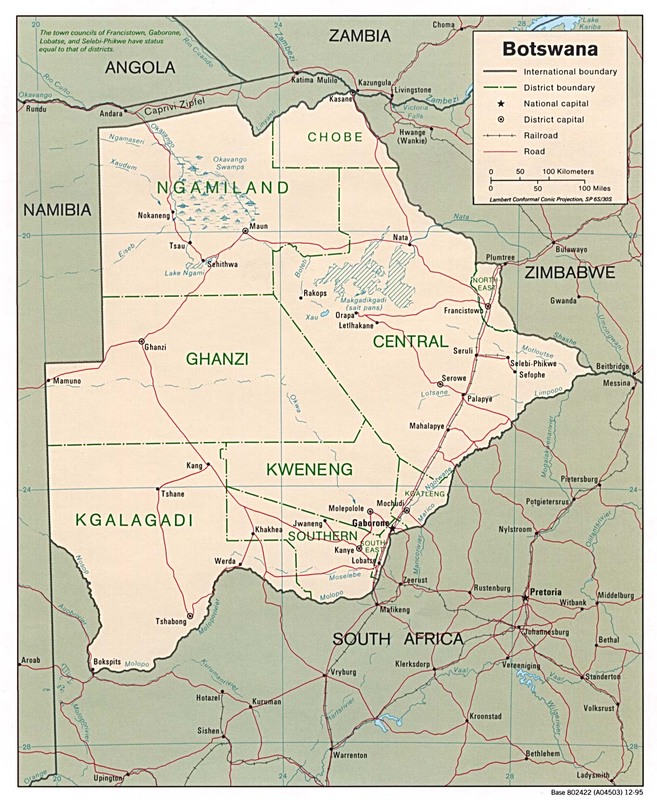 The affected regions center mainly around the Kalahari Desert but also in the northwest surrounding the Okavango Delta Region. The environmental problem is a mix of drought and desertification across Botswana with the added component of human-caused land degradation. The predicted increase in temperature, drop in precipitation, and continued expansion of grazing contributes to significant environmental damage. 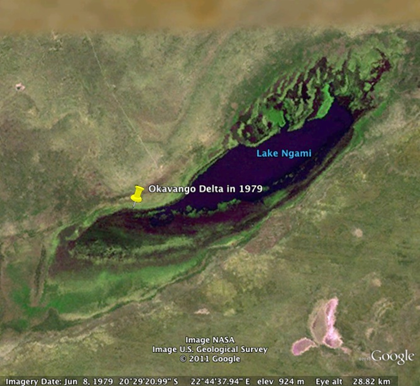 The images below were created in Google Earth and indicate an environmental change in the Okavango Delta in a 32-year period of time. The image on the left from 1979 indicates a large water delta with lush green-space surrounding, while the image on the right clearly reveals a receding delta and a significant decrease in fauna in the surrounding landscape. The drought patterns and desertification of the surrounding region may contribute to conflict regarding these important natural resources. 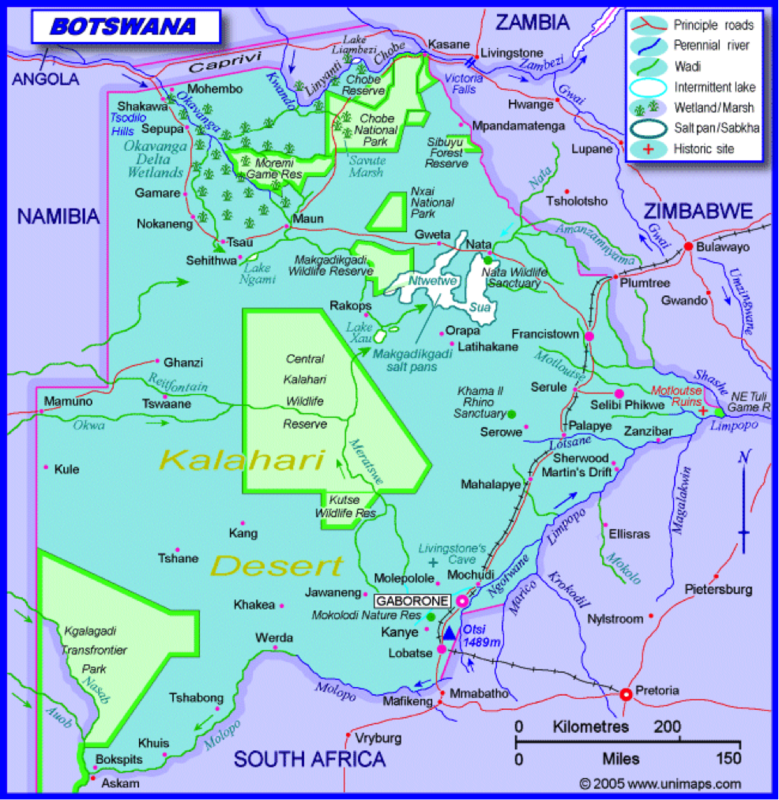 The Kalahari sand deposit makes up eighty percent of Botswana. This area maintains some grasslands and savannah in the Central Kalahari, though grazing; heat, drought and desertification are expanding the reach of the desert habitat. 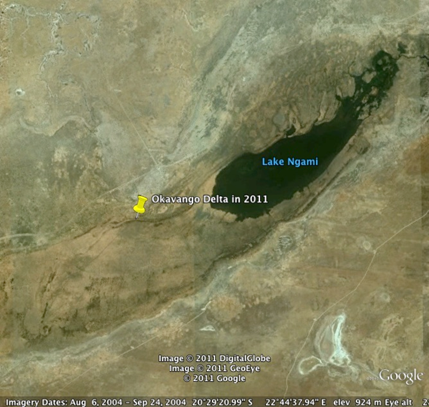 The amount of precipitation in Botswana is low and will continue to decrease throughout the next fifty years. The Kalahari desert and Okavango River Basin. The act and harm sites are one in the same, in that there is simply a delay between the act and the result. The act will continue to impact the harm without policy measures put in place to avoid this conflict. While the conflict itself is materializing into a civil dispute between ethnic tribes regarding land use, the issue is not particular to Botswana. Around the Okavango, Namibia and Angola are experiencing a similar problem due to land degradation and overgrazing. Ethnic groups share similarities across borders, creating a domestic problem that may have international implications. The conflict is in the resource access level of conflict and the key concern is how this will materialize in the coming years. There is a certain amount of time in which the government can institute policies to reduce the probability of conflict. As this case study is focusing on a conflict scenario that is still developing, there is not much data on actual levels of fatality. Given that any deaths would, at this point, be rather isolated, the concern is focused on the severity of natural resource depletion and its resulting compulsion of ethnic-related civil violence. 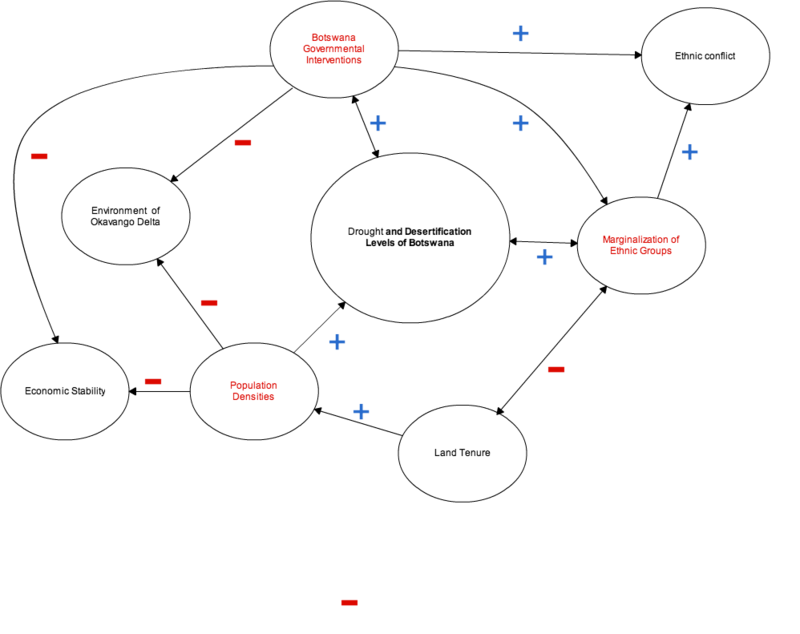 This diagram indicates the causal factors and relationships that contribute to the drought and desertification levels of Botswana. These factors are indicative of a growing issue that combines natural climate changes and contributing factors of humans that may lead to climate-based conflict. 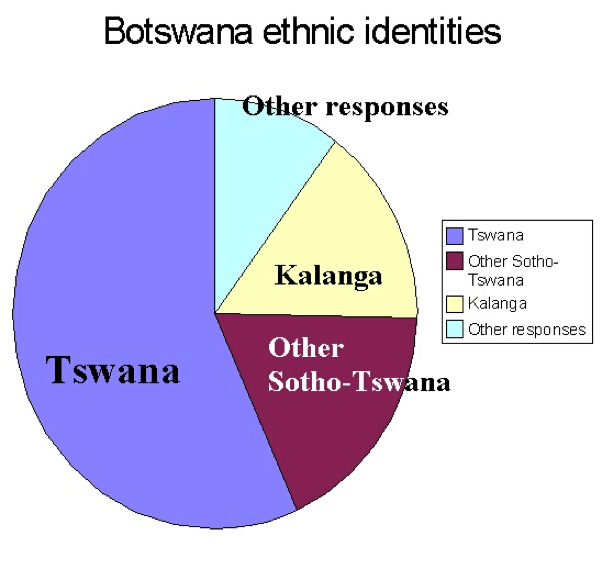 The main criteria are highlighted in red, indicating the importance of the marginalization of ethnic groups, the intervention strategies of Botswana’s government, and the population densities. While all of these relationships are multidimensional in nature, I have made the relationships direction-based, indicating causal implications denoted with a “+” or “-“ sign indicating the direction of the relationship. A positive relationship indicates that the increase in one factor (ie government interventions) leads to an increase in another factor (ie marginalization of ethnic groups). Moreover, a negative relationship indicates a increase in one factor (ie government intervention) has a negative impact on another factor (ie economic stability). This conflict is of strong interest to the state given the potential for civil strife based on ethnic distinctions. Preventative policy initiatives need to be adopted in order to maintain unity while adapting to climate changes and exploring other options for national economic success. Mbaiwa, J. E. (2004). Causes and possible solutions to water resource conflicts in the Okavango River Basin: The case of Angola, Namibia and Botswana. [doi: 10.1016/j.pce.2004.09.015]. Physics and Chemistry of the Earth, Parts A/B/C, 29(15-18), 1319-1326. Mbaiwa, J. E., Ngwenya, B. N., & Kgathi, D. L. (2008). Contending with unequal and privileged access to natural resources and land in the Okavango Delta, Botswana. [Article]. Singapore Journal of Tropical Geography, 29(2), 155-172. Robert Tony Watson, M. C. Z., Richard H. Moss. (1998). The Regional Impacts of Climate Change: An Assessment of Vulnerability: Cambridge University Press.